Technical trekking trousers with Curved Fit, designed for women with curvy figures. The fit is more generous over the rear and thighs, while the waist is a little more accentuated than on other trouser models. This gives a more comfortable pair of trousers that sit better on a curvy figure, without being tight, bunching or having a gap at the back of the waist. 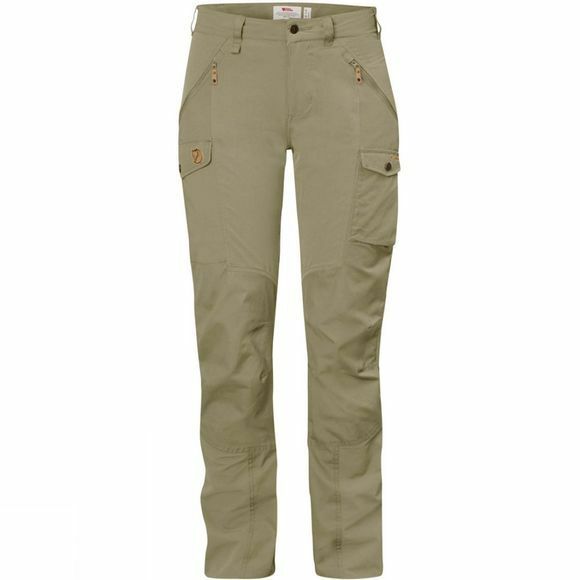 The trousers combine stretch fabric and G-1000 for excellent freedom of movement and durability – perfect when trekking when you do not want to be restricted by tight trousers. The rear and knees are pre-shaped for the best possible fit, and the waist is cut lower at the front and higher at the back so they sit well when you are carrying a backpack and moving about. Hand pockets with zips are positioned so they are easily accessed even when wearing a backpack with a hipbelt. One large leg pocket with flap and a smaller inner pocket in mesh on the right leg, plus a smaller leg pocket for a mobile phone or GPS on the left leg. Stretch fabric below the waist and G-1000 reinforcements over the rear, knees and hems. Raw hems let you easily adjust the leg length to your own height.